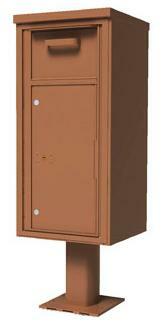 These pedestal mailboxes use the USPS STD-4C regulation and meet or exceed all security requirements. They are constructed of 300 series stainless steel and aircraft aluminium, including a heavy duty aluminium pedestal. This unit is so versatile it is customizable in virtually hundreds of configurations, including collection drop boxes and trash and recycling bins. Contact us for something custom! 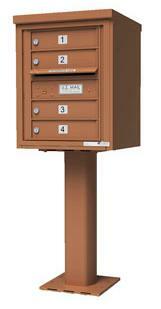 As with all group mailboxes you must get your local Post Office approval, and with small group mailboxes it is even more important. Note: Prices include Locks and Keys, Numbering, Pedestal, plus Free Delivery.